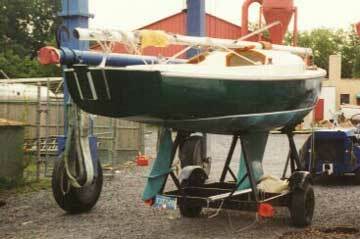 Due to failure of keel fairing material and gelcoat below waterline, keel and hull were scraped clean in mid-1990s. Hull coated with marine epoxy, but keel remains unfinished. Trailer is an unusual design that cradles boat, but cannot be used for launching. Tires should be replaced before boat is transported any significant distance. Damaged turnbuckle on forestay; worked fine for 3 seasons of fairly easy sailing, but probably should be replaced. One of my boats, the 1963 Rainbow has been sold and is on its way to a new home in South Carolina. Thank you very much for your assistance and excellent web site.